Whether you're moving down the street or off to a new home in Texas, New York or Montana, you can count on Lighthouse Movers Inc to get your belongings there safely. Our experienced team knows that moving can be stressful, and we're happy to shoulder the burden for you. You can rely on our team to tackle all of the heavy lifting. Discuss your moving needs with one of our team members during your free moving consultation. We'll take into account the objects being moved and how far they need to be moved in order to provide you with a fair and accurate quote. Once you've approved of our estimate, we'll schedule your move - and you can mark one more item off your to-do list. Call Lighthouse Movers of Jacksonville, FL at 904-217-1000 to get the ball rolling. Reach out to the team at Lighthouse Movers to discuss your next move. We're your experienced moving company in Jacksonville, FL! Trying to pack up your entire life can be a major challenge-let Jacksonville, Florida's Lighthouse Movers take some of the hassle out of your move. We can provide boxes, packing supplies, and carefully pack up your entire home. We'll pad and wrap all of your belongings before loading them into our truck. For your peace of mind, we guarantee that all of your items will be transported and unloaded safely. Once our truck reaches your new home, we'll unload and assist with the reassembly of your furniture. We can be involved in the move as much or as little as you'd like. Contact Lighthouse Movers of Jacksonville, FL to find out what we can do to simplify your next move. Lighthouse Movers was INCREDIBLE. Not only have I recommended them to quite a few people since our move, I will be using them again in a few months to move again. They were awesome with my stuff, on time, very clean and respectful crew, and delivered the job in less time that estimated. I have used quite a few moving companies in my life, but I have not found one as good to work with as this one. Besides, it was great to support a local family owned company. Excellent attitude, hard work and very safe. 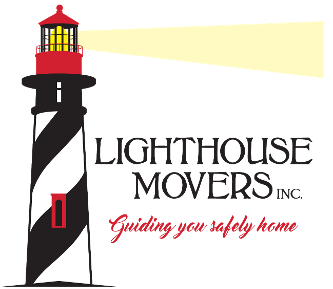 Lighthouse Movers are great, they helped my fiance and I move from St. Augustine to Tampa very easily. The customer service was top notch and they were accommodating to all our moving needs. I was specifically impressed with the level of care for our furniture, treating it as if it were their own. Everyone we dealt with looked and acted professional, we will definitely be back for our next move. These guys are the best moving team I have have worked with. They were professional, courteous, helpful, and most of all very reasonable and accommodating. Thanks for doing a great job. I've used Light House Movers twice, moving from Green Cove Spring to Palm Coast, then from Palm Coast to Jacksonville. Each time was a good experience with a respectable crew. I will be using them again in the future. Lighthouse Movers Inc handled a local move for us of some commercial equipment, They finished within 15 minutes of their estimated time. No damages to anything. I'll use them again.